A red disc on a green field. The national flag of Bangladesh (Bengali: বাংলাদেশের জাতীয় পতাকা) was adopted officially on 17 January 1972. The red disc is for the sun rising over Bengal. It also is for the blood of those who died for the independence of Bangladesh. The green field stands for the lushness of the land of Bangladesh. 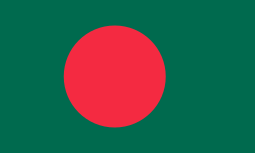 The first flag of an Independent Bangladesh with the country map that does not exist in the current flag. This page was last changed on 28 August 2017, at 18:26.